Warrior ONE - HAPPY BIRTHDAY GANDHI!!! This week's post is dedicated to the birth of one of the most influential pioneers of modern peaceful resistance, Mohandas Gandhi. His development and teachings of satyagraha "truth and firmness", led India through powerful nonviolent resistance to gain independence from Great Britain. Mohandas was is well known by the name Mahatma, "The great-souled one". While his journey was peaceful, it was NOT easy. 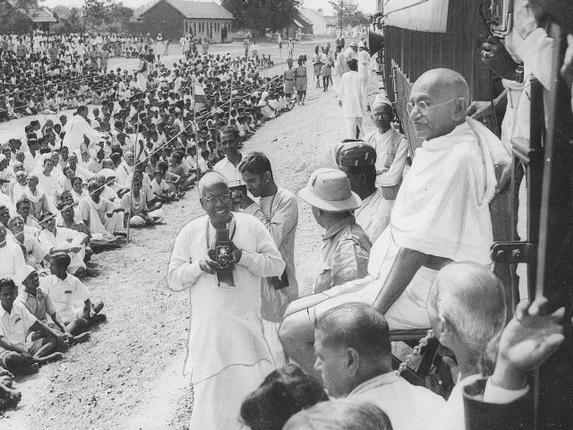 He was thrown in jail multiple times for standing up for the poorest classes of India, and eventually murdered for being a leader in nonviolent revolution. We are continually inspired by his nonviolent active resistance to injustice and willingness to stand up for those in need. 1. PRACTICE AHIMSA TOWARDS YOURSELF: It starts with you. Ahimsa (nonviolence) is one of the eight limbs of yoga. When you go inward and practice nonviolence, you can spread nonviolence and peace to others. This means giving your body the space to feel what it needs to feel. Nonviolence does not mean that you don't feel angry. Often times anger is wrongly associate with hate. You can be angry out of LOVE for the greater good, for what is right, and not be hateful or lash out. In fact, it's important to feel your emotions completely before letting them go. There is nothing worse than repressing your emotions because you think you have to be peaceful and happy all the time...THAT can lead to violence and lashing out. Find a space, like a yoga or meditation class, to work through your emotions in a safe and effective way. 2.SPEAK UP: Nonviolence does not mean silence or passivity. When you see injustice or mistreatment say something about it! Even if it's friends or family and even if it makes the situation uncomfortable, you must call it out when you hear it. Remember, when people are uncomfortable it creates possibility for growth and change. YOU can make a difference when you speak up. 3.SHOW UP: With a simple google search, it's easy to look up groups in your community who take action for change. You can be a part of nonviolent protest marches, making calls to elected officials of office to let them hear your voice, or organizing fundraisers for a specific cause. The key here is to take action! It's not enough just to disagree with what is happening, you have to physically resist against it. 'Non-violence is not a garment to be put on and off at will. Its seat is in the heart, and it must be an inseparable part of our being."